Help Autistic Children Ride the School Bus with a Social Story & Play! My dad has been a school bus driver since I was in junior high, and my kids think that’s the coolest thing ever. See, homeschooled kids don’t get to ride the bus too often. Do my kids actually know how to ride the school bus? I’m sure most of the kids would figure it out naturally, but I know that A-Man needs a lot of exposure before he can truly process how to do something. 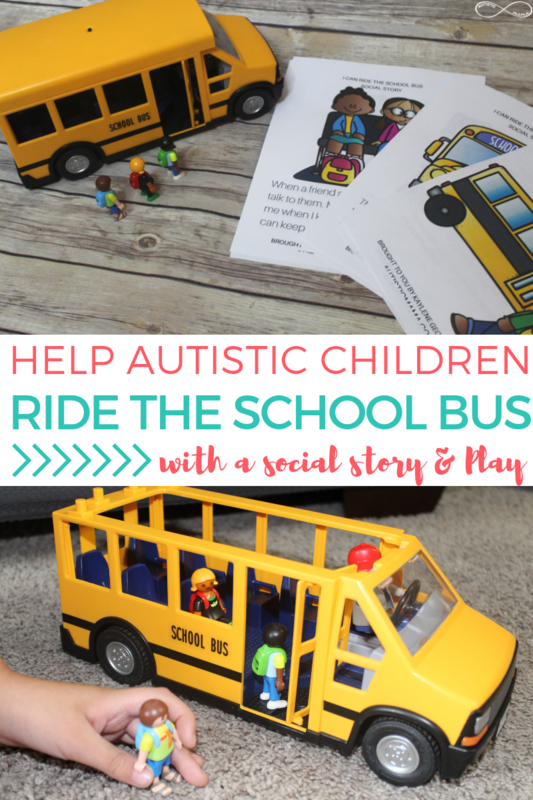 And if you’re working on teaching autistic children to ride the school bus, this is the post for you. Because I’m going to share exactly how to use imaginative play and an “I Can Ride the School Bus” social story to teach autistic children to ride a school bus. We had so much fun with this activity. 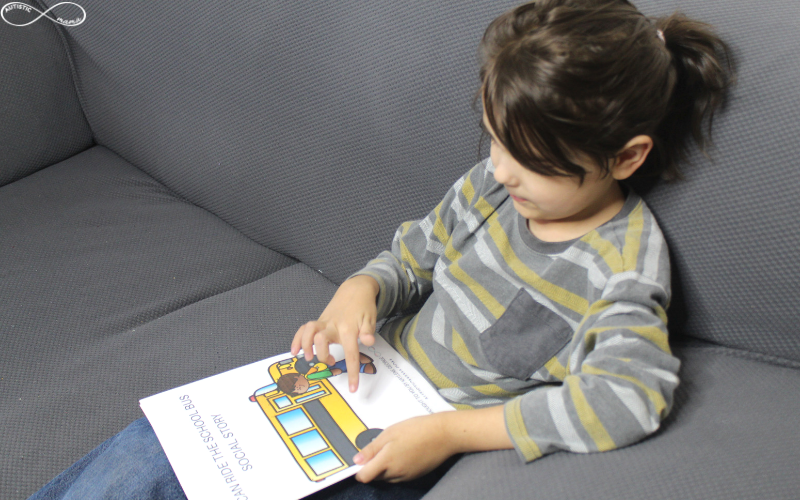 A-Man loved playing with the bus and reading through the social story with us! Now if he starts to ride the school bus, or he goes for a ride with Papa, he knows what to expect and we can have a meltdown-free bus ride! 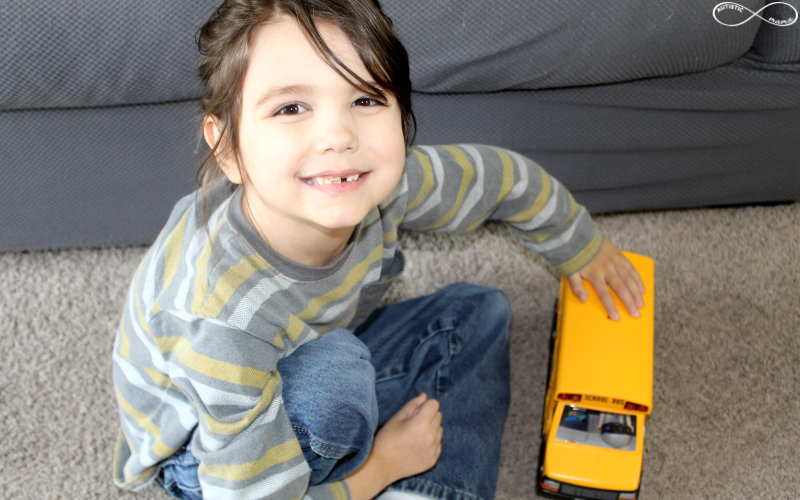 All you need for this activity is the PLAYMOBIL City Life School Bus, and the “I Can Ride the School Bus” Social Story Printable that you can download before! It is really important to teach autistic children to ride the school bus for safety. Waiting at a bus stop can be dangerous if children don’t understand the social norms of where to stand and how to act while waiting. 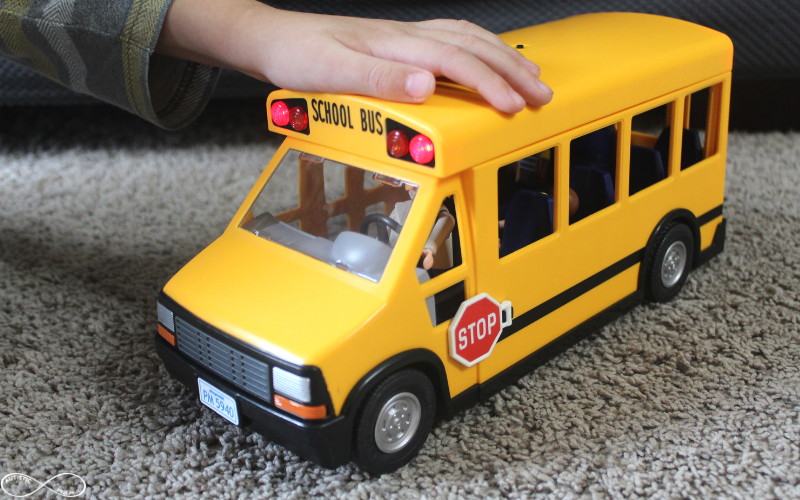 Once we read the social story, we used the PLAYMOBIL School Bus to act out how you would stand with your friends and wait for the school bus, and how you would line up to walk on. 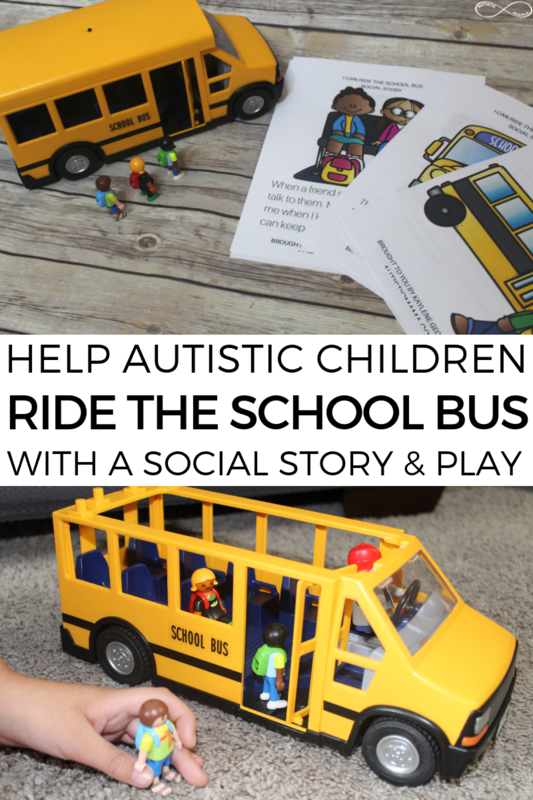 Teaching autistic children to ride the school bus also teaches them pretty vital social skills. There is a lot of social interaction involved with riding the school bus, from saying hello to the bus driver to letting a friend sit next to you. 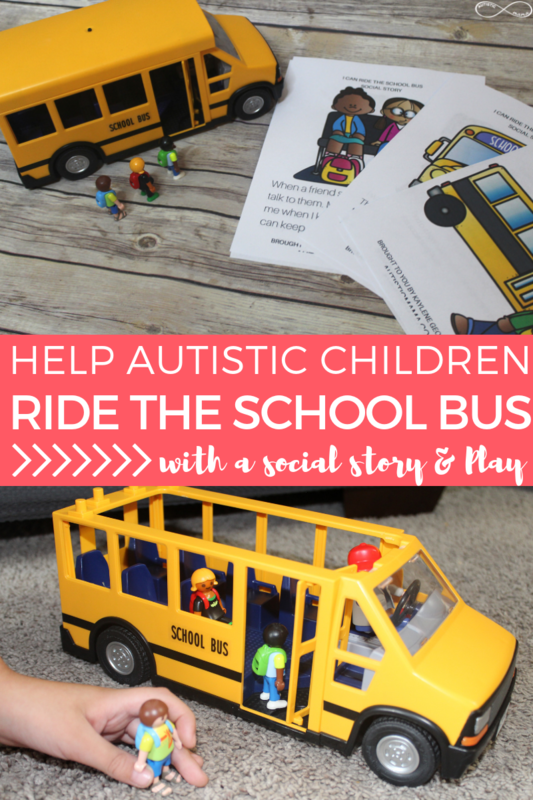 In the “I Can Ride the Bus” social story we talk about how to handle these social interactions so that your autistic child knows what to expect and what is expected of them when riding the school bus. A-Man’s favorite part was saying hi to the bus driver because he pretended the bus driver was Papa! 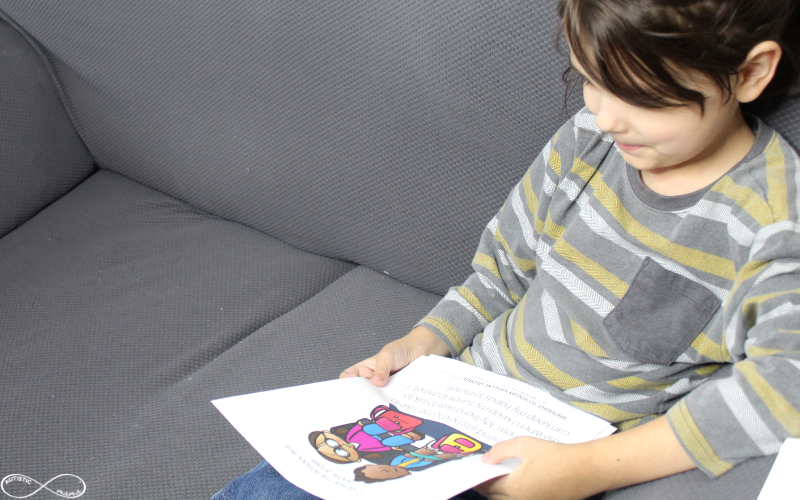 Now, if you haven’t heard of it before, a social story is a social learning tool that helps parents, teachers, or therapists communicate with autistic children (or adults!) about social situations that they may face. The social story is written from the autistic child’s perspective and helps them to clearly see what to expect and what others expect from them during a social interaction. When I’m looking for, or writing, social stories I make sure that they don’t frame natural autistic behaviors as bad, and we keep everything very positive. Waiting safely at the bus stop. Hearing the loud noises as the bus arrives. Getting in line and walking on the bus. Saying hi to the bus driver as you walk on the bus. Walking down the aisle to find a seat. Making room for a friend by putting your bag on the floor. Sitting with a friend while keeping your hands to yourself. With this social story, your autistic child will have a solid understanding of the entire process of riding the bus to school each morning. Once we read through the social story, we were ready for some imaginative play! 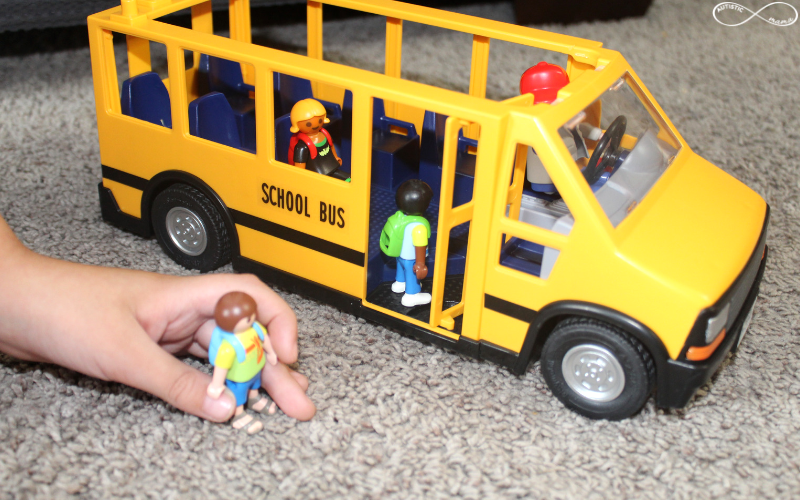 We got out our PLAYMOBIL School Bus and A-Man loved acting out some of the steps we had just learned about riding the bus! 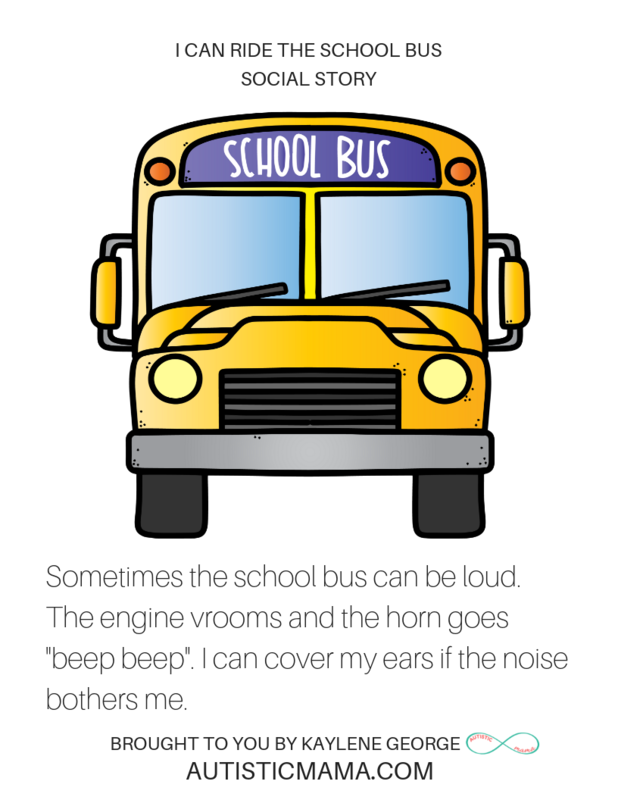 He had the students wait at the bus stop, and then made the loud noises as the bus pulled up to the stop. He lined up the students and started having them walk on the bus. He even had them say “hi” to the bus driver! He got really excited that the PLAYMOBIL School Bus lights actually light up just like a real school bus. As he played, I was amazed to see what his imagination came up with. Before long, his school bus was a magic flying school bus. I loved that the PLAYMOBIL School Bus is so realistic that it made it easy for my son to really dive into imaginative play. The lights at the front actually flash, and the bus door actually swings open like a school bus would. I was really impressed with the PLAYMOBIL toys that are high-quality and had such a strong attention to detail. PLAYMOBIL brings you imaginative play sets focused around iconic figures from a variety of worlds, both realistic (like police, firemen, school buses etc.) and fantastical (like modern-day dinos). And the play sets help to develop both cognitive and social/emotional skills, and I’ve found them really helpful for my autistic son. The best part? 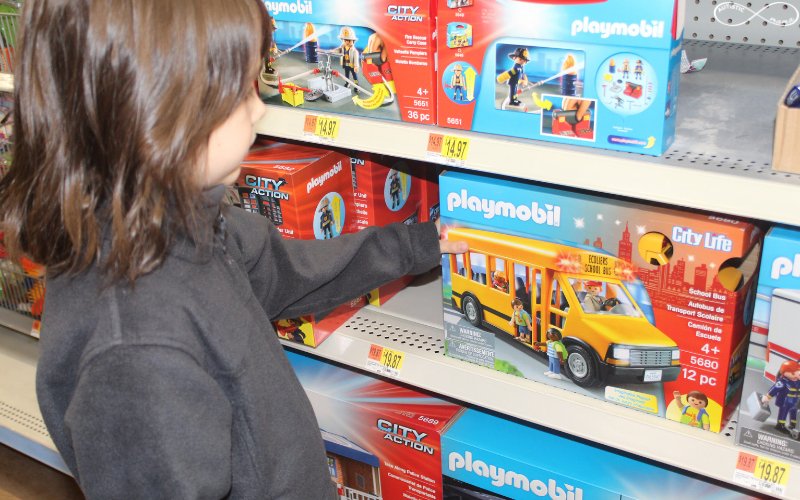 You can check out the PLAYMOBIL play sets at Walmart, so it doesn’t even require an extra trip! 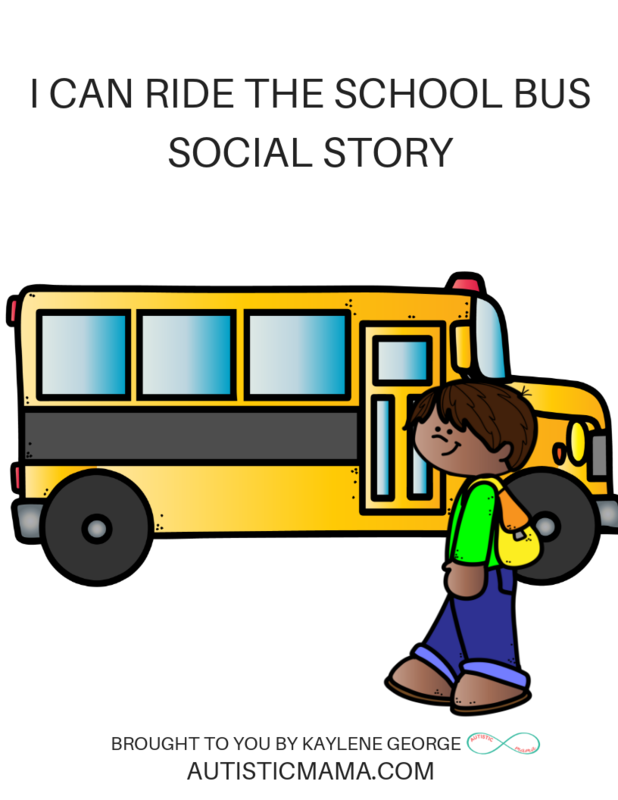 Now, how can you download the “I Can Ride the School Bus” Social Story? 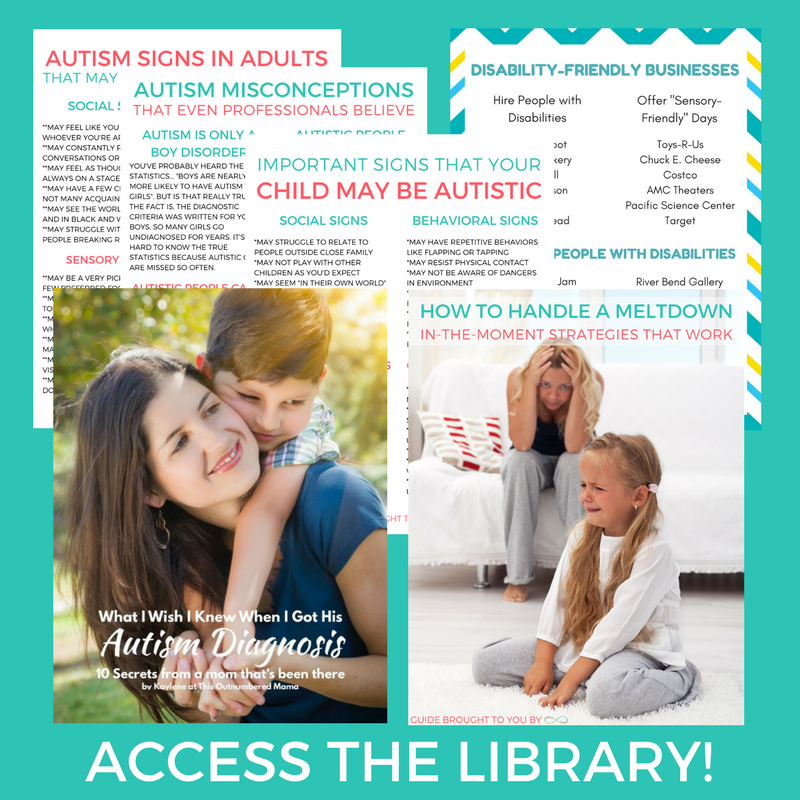 Simply click here, tell me a little bit about your specific situation, and you’ll get access to the social story AND the entire resource library full of printables and resources for parents of autistic children! Love this idea! Sometimes being able to roleplay or act out that situation is a HUGE help for any child.